Port agency, stevedoring, loading, discharging, storage and transport. The range of services at newly established Blue Water BREB GmbH is wide. And its services are based on years of experience and expertise. Since 2008, BREB ((Bremer Reederei E&B) has been active in the German offshore wind industry. Today the company has offices in Bremen, Cuxhaven (headoffice), Sassnitz-Mukran and on Heligoland, and BREB is one of the leading German port agents for the wind industry. BREB has joined forces with the international, danish-owned transport and logistics company Blue Water Shipping. For more than 20 years, Blue Water has been providing services to the wind industry both on- and offshore. The company is headquartered in Esbjerg, Denmark – the world’s biggest port for shipment of wind turbines. And Blue Water Shipping – with more the 60 offices worldwide - has been involved in numerous projects all over the world. 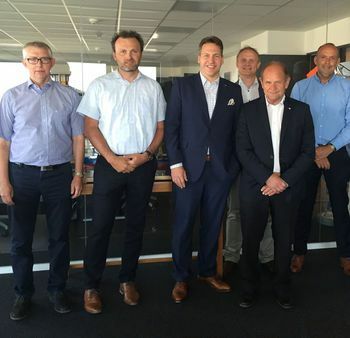 From Left: Søren Stougaard, Peter Ehrhorn/Blue Water, Arne Ehlers/Managing Director of BREB, Brian Sørensen, Kurt Skov and Per Jensen from Blue Water. “Blue Water BREB has a unique set-up, combining the knowledge and expertise of two strong companies – and with this joint venture, we can now offer all types of transport and logistical services at all key locations for the German offshore wind industry,” states Arne Ehlers, Managing Director and Partner of BREB. BREB was founded in 1951 as Bremer Reederei Eilemann & Bischoff and owns a fleet of ultramodern MPC vessels. The company’s activities include chartering, liner services and port agency. Blue Water Shipping was founded in 1972 in Esbjerg, Denmark by Kurt Skov, and today the company’s 1400 employees offer shipping, transport and logistics from its 64 worldwide offices.